Found with almost all other rare-earth metals but never by itself, lutetium is very difficult to separate from other elements. 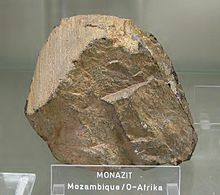 Its principal commercial source is as a by-product from the processing of the rare earth phosphate mineral monazite (Ce,La,...)PO4, which has concentrations of only 0.0001% of the element, not much higher than the abundance of lutetium in the Earth crust of about 0.5 mg/kg. No lutetium-dominant minerals are currently known. The main mining areas are China, United States, Brazil, India, Sri Lanka and Australia. The world production of lutetium (in the form of oxide) is about 10 tonnes per year. Pure lutetium metal is very difficult to prepare. It is one of the rarest and most expensive of the rare earth metals with the price about US$10,000 per kilogram, or about one-fourth that of gold. Because of production difficulty and high price, lutetium has very few commercial uses, especially since it is rarer than most of the other lanthanides but is chemically not very different. However, stable lutetium can be used as catalysts in petroleum cracking in refineries and can also be used in alkylation, hydrogenation, and polymerization applications. Lutetium aluminium garnet (Al5Lu3O12) has been proposed for use as a lens material in high refractive index immersion lithography. Additionally, a tiny amount of lutetium is added as a dopant to gadolinium gallium garnet (GGG), which is used in magnetic bubble memory devices. Cerium-doped lutetium oxyorthosilicate (LSO) is currently the preferred compound for detectors in positron emission tomography (PET). Lutetium aluminium garnet (LuAG) is used as a phosphor in LED light bulbs. Aside from stable lutetium, its radioactive isotopes have several specific uses. The suitable half-life and decay mode made lutetium-176 used as a pure beta emitter, using lutetium which has been exposed to neutron activation, and in lutetium–hafnium dating to date meteorites. The synthetic isotope lutetium-177 bound to octreotate (a somatostatin analogue), is used experimentally in targeted radionuclide therapy for neuroendocrine tumors. Indeed, lutetium-177 is seeing increased usage as a radionuclide in neuroendrocine tumor therapy and bone pain palliation. Research indicates that lutetium-ion atomic clocks could provide greater accuracy than any existing atomic clock. ^ Samsonov, G. V., ed. (1968). "Mechanical Properties of the Elements". Handbook of the physicochemical properties of the elements. New York, USA: IFI-Plenum. pp. 387–446. doi:10.1007/978-1-4684-6066-7_7. ISBN 978-1-4684-6066-7. Archived from the original on 2015-04-02. ^ Greenwood, Norman N.; Earnshaw, Alan (1997). Chemistry of the Elements (2nd ed.). Butterworth-Heinemann. p. 1223. ISBN 978-0-08-037941-8. ^ Parker, Sybil P. (1984). Dictionary of Scientific and Technical Terms (3rd ed.). New York: McGraw-Hill. ^ a b Patnaik, Pradyot (2003). Handbook of Inorganic Chemical Compounds. McGraw-Hill. p. 510. ISBN 978-0-07-049439-8. Retrieved 2009-06-06. ^ a b c d e Krebs, Robert E. (2006). The history and use of our earth's chemical elements: a reference guide. Greenwood Publishing Group. pp. 303–304. ISBN 978-0-313-33438-2. ^ "Chemical reactions of Lutetium". Webelements. Retrieved 2009-06-06. ^ Persson, Ingmar (2010). "Hydrated metal ions in aqueous solution: How regular are their structures?". Pure and Applied Chemistry. 82 (10): 1901–1917. doi:10.1351/PAC-CON-09-10-22. ISSN 0033-4545. ^ a b c d e Georges, Audi; Bersillon, Olivier; Blachot, Jean; Wapstra, Aaldert Hendrik (2003). "The NUBASE Evaluation of Nuclear and Decay Properties" (PDF). Nuclear Physics A. 729 (1): 3–128. Bibcode:2003NuPhA.729....3A. CiteSeerX 10.1.1.692.8504. doi:10.1016/j.nuclphysa.2003.11.001. Archived from the original (PDF) on 2016-01-17. ^ James, C. (1907). "A new method for the separation of the yttrium earths". Journal of the American Chemical Society. 29 (4): 495–499. doi:10.1021/ja01958a010. In a footnote on page 498, James mentions that Carl Auer von Welsbach had announced " … the presence of a new element Er, γ, which is undoubtedly the same as here noted, … ." The article to which James refers is: C. Auer von Welsbach (1907) "Über die Elemente der Yttergruppe, (I. Teil)" (On the elements of the ytterbium group (1st part)), Monatshefte für Chemie und verwandte Teile anderer Wissenschaften (Monthly Journal for Chemistry and Related Fields of Other Sciences), 27 : 935-946. ^ "Separation of Rare Earth Elements by Charles James". National Historic Chemical Landmarks. American Chemical Society. Retrieved 2014-02-21. ^ a b Urbain, G. (1907). "Un nouvel élément: le lutécium, résultant du dédoublement de l'ytterbium de Marignac". Comptes Rendus. 145: 759–762. ^ Urbain, G. (1909). "Lutetium und Neoytterbium oder Cassiopeium und Aldebaranium -- Erwiderung auf den Artikel des Herrn Auer v. Welsbach". Monatshefte für Chemie. 31 (10): 1. doi:10.1007/BF01530262. ^ a b Thyssen, Pieter; Binnemans, Koen (2011). "Accommodation of the Rare Earths in the Periodic Table: A Historical Analysis". In Gschneider, Karl A., Jr.; Bünzli, Jean-Claude; Pecharsky, Vitalij K. (eds.). Handbook on the Physics and Chemistry of Rare Earths. Amsterdam: Elsevier. p. 63. ISBN 978-0-444-53590-0. OCLC 690920513. Retrieved 2013-04-25. ^ a b c d e f Emsley, John (2001). Nature's building blocks: an A-Z guide to the elements. Oxford University Press. pp. 240–242. ISBN 978-0-19-850341-5. ^ Hedrick, James B. "Rare-Earth Metals" (PDF). USGS. Retrieved 2009-06-06. ^ Wei, Yayi; Brainard, Robert L. (2009). Advanced Processes for 193-NM Immersion Lithography. SPIE Press. p. 12. ISBN 978-0-8194-7557-2. ^ Nielsen, J. W.; Blank, S. L.; Smith, D. H.; Vella-Coleiro, G. P.; Hagedorn, F. B.; Barns, R. L.; Biolsi, W. A. (1974). "Three garnet compositions for bubble domain memories". Journal of Electronic Materials. 3 (3): 693–707. Bibcode:1974JEMat...3..693N. doi:10.1007/BF02655293. ^ Wahl, R. L. (2002). "Instrumentation". Principles and Practice of Positron Emission Tomography. Philadelphia: Lippincott: Williams and Wilkins. p. 51. ^ Daghighian, F.; Shenderov, P.; Pentlow, K. S.; Graham, M. C.; Eshaghian, B.; Melcher, C. L.; Schweitzer, J. S. (1993). "Evaluation of cerium doped lutetium oxyorthosilicate (LSO) scintillation crystals for PET". IEEE Transactions on Nuclear Science. 40 (4): 1045–1047. Bibcode:1993ITNS...40.1045D. doi:10.1109/23.256710. ^ Bush, Steve (14 March 2014). "Discussing LED lighting phosphors". Electronic Weekly. Retrieved 26 January 2017. ^ Simard-Normandin, Martine (2011). "A19 LED bulbs: What's under the frosting?". EE Times (July 18): 44–45. ISSN 0192-1541. ^ Muriel Gargaud; Hervé Martin; Philippe Claeys (2007). Lectures in Astrobiology. Springer. p. 51. ISBN 978-3-540-33692-1. ^ Sigel, Helmut (2004). Metal complexes in tumor diagnosis and as anticancer agents. CRC Press. p. 98. ISBN 978-0-8247-5494-5. ^ Balter, H.; Trindade, V.; Terán, M.; Gaudiano, J.; Ferrando, R.; Paolino, A.; Rodriguez, G.; Hermida, J.; De Marco, E.; Oliver, P. (2015). "177Lu-Labeled Agents for Neuroendocrine Tumor Therapy and Bone Pain Palliation in Uruguay". Current Radiopharmaceuticals. 9 (1): 85–93. doi:10.2174/1874471008666150313112620. PMID 25771367. ^ Carollo, A.; Papi, S.; Chinol, M. (2015). "Lutetium-177 Labeled Peptides: The European Institute of Oncology Experience". Current Radiopharmaceuticals. 9 (1): 19–32. doi:10.2174/1874471008666150313111633. PMID 25771368. ^ Arnold, K.J. ; Kaewuam, R.; Roy, A.; Tan, T.R. ; Barrett, M.D. (2018). "Blackbody radiation shift assessment for a lutetium ion clock". Nature Communications. 9 (1): 1650. arXiv:1712.00240. Bibcode:2018NatCo...9.1650A. doi:10.1038/s41467-018-04079-x. PMC 5917023. PMID 29695720. ^ Blasse, G.; Dirksen, G.; Brixner, L.; Crawford, M. (1994). "Luminescence of materials based on LuTaO4". Journal of Alloys and Compounds. 209 (1–2): 1–2. doi:10.1016/0925-8388(94)91069-3. ^ Shionoya, Shigeo (1998). Phosphor handbook. CRC Press. p. 846. ISBN 978-0-8493-7560-6. ^ Gupta, C. K.; Krishnamurthy, Nagaiyar (2004). Extractive metallurgy of rare earths. CRC Press. p. 32. ISBN 978-0-415-33340-5.